Get your wellies out, in 2019 we are going to be knee deep in tears of joy and chocolate mud. Solstice & Xmas, celebrating the sun of God and the son of God simultaneously, Indonesian Mother’s day, coinciding with the arrival of no one less than my very own Mother here in Bali. 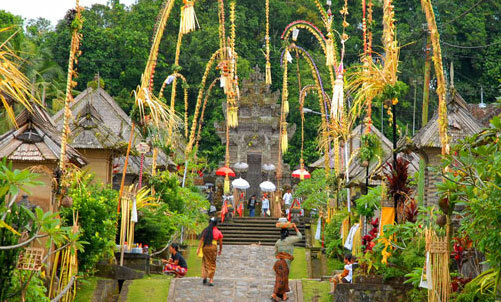 On TOP of that, the whole of Bali is preparing for that super sweet and special day in their 210 day calendar cycle, Galungan. It is really their version of Xmas. So as Western Expats and Balinese wannabees alike are raising Xmas trees around Bali, (the tree at Zest is made from straw) every Balinese person is simultaneously raising their version of a Xmas tree: the Penjor (whilst western wannabees like myself are watching in awe). The Penjor is a magical giant bamboo pole shrouded in occult symbolic grandeur, and offerings to honour the Gods and their home of the sacred East Bali volcano Mount Agung. It’s a time that the ancestral spirits are coming home for a period of 10 days to spend time with their families feasting and forgiving, laughing and loving. I guess this giant bamboo post is a good way for the Ancestors to recognize their family home. All of this magic is playing out over the next few days. Are you still breathing because I barely am! I hope you will take time to bask in joy, relaxation and a knowing that you’ve done amazing. Far beyond anything you realize. You’ve touched many hearts, changed people lives with your very glance and made people’s day with the profound things you said. They all love you, your parents, the Universe, Jesus, Buddha, and especially that jolly chubby man with the white beard. Ho Ho Ho. In other words, Carpe Scrotum, grab life by the balls. Be humble, but don’t be shy. Be kind, but most of all be real. Trust your body’s reaction to every person, place or situation and stay in your truth. The only way to give your power away is by fearing them or believing you need them. Align with your only source of power which is within, allow your love of all (including yourself) to flow. Show up, act and speak from that knowing of perfection and notice how you will become a magnet.. on steroids. There won’t be a need to protest, state your boundaries, resist or judge as you are simply too busy voting for all the good things you believe in with every word you say and every thought you think. Halo and all! You go, you angel-winged maddafakka! I’m leaving a turbulent, creative and crazy explosive 2018. We gave birth to Zest Ubud (which is successful beyond anything we imagined) The New Earth Cooking school became a reality (even though I still think I’m dreaming). I shared my love of food around Asia, Australia and Africa and I can confirm a mass awakening is happening across the globe. Sure there have been raging storms, earth quakes, lighting strikes, bursting hearts, bandaids, sore thumbs and tough love but most of all, and I will sum all the good stuff up in one way, I’m experiencing a glimpse of the Paradise this Earth will be. I hope you are brave enough to get onboard the New Earth Ship because this Titanic ain’t waiting or sinking! We’re waiting to hear from YOU at hello@newearthcooking.com.